Willy Wonka had his much sought-after Golden Tickets, but Cleland Wildlife Park in Adelaide, South Australia, has something even rarer – golden wombats! 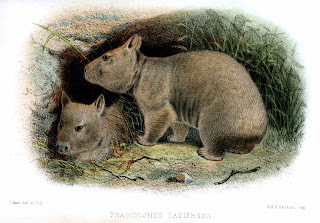 The southern hairy-nosed wombat Lasiorhinus latifrons normally has black, brown, or grey fur. However, Icy and Polar both sport an astonishingly beautiful, bright golden pelage, as if King Midas from classical Greek mythology had gifted them with his gold-transforming touch. 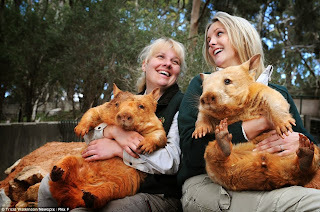 These two bear-like but herbivorous marsupials are three-and-a-half years old, arriving at the park after having been found in the wild six months apart of each another and raised afterwards in a rescue centre. Their golden colouration, a phenomenon known as flavism, is the result of a mutant gene allele. Yet although aesthetically exquisite, it makes such wombats very visible in the wild and therefore highly vulnerable to predators. Consequently, very few specimens ever survive, and there is only one other golden wombat in captivity. So Icy and Polar (although surely Goldie and Sunny might be more apt names for them?) are extremely special and highly-prized by the park, whose staff hope that they will breed when older (despite their shared golden hue, they are not related to one other).